Girls gymnastics poses for a picture. 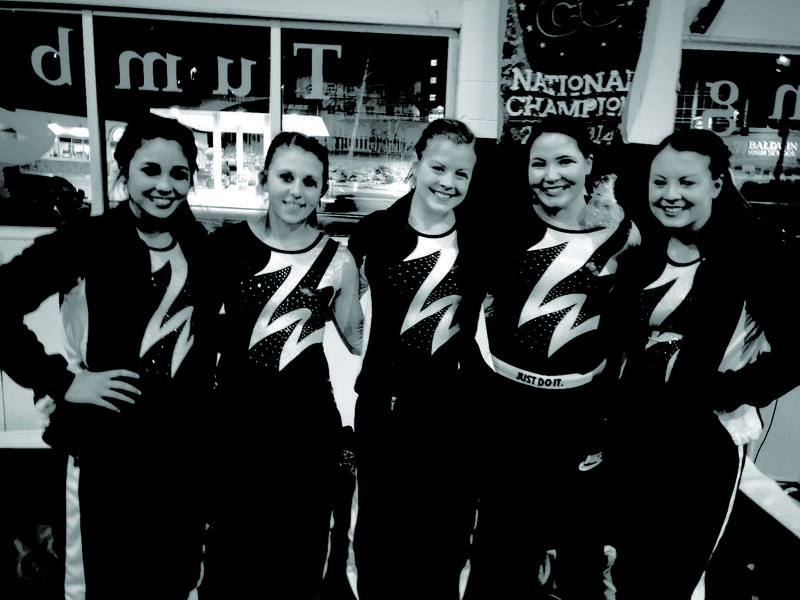 The gymnastics team had an impressive season last year: They finished second in the state as a team in the bronze division, and junior Alaina Wodarek took home a first-place gold medal for her floor routine at WPIALs. This year the goal is to maintain or even improve upon that success. The team added six freshmen this year, which gives the team more depth. “The freshmen are amazing, and I think they will definitely help improve our scores this season,” senior Haili Cordell said. The freshmen consist of Mia Dougherty, Kaylee Garofalo, Haley Staab, Emily Schwab, Abigail Herrle, and Hanna Kuchnicki. Garofalo and Dougherty in particular have stood out in practices because they have participated in the sport the longest and they also compete in USA gymnastics tournaments, Staab said. “We have room for improvement for sure, but I am confident on a great season,” Dougherty said. The team has two sophomores, Julia Stepetic and Bailey Harding. The lone junior is Wodarek, and Cordell is joined by Erin Winkowski as the team’s seniors. The entire team has been practicing hard with the goal of repeating last year’s success. “Our routines fit our skills very well, and I am improving every time we practice,” Staab said. Winkowski said the team is coming together closer than last year’s team, and everyone is bonding. “I cannot wait to see how this season turns out with both improvements to all of us and our friendships all together,” Winkowski said. Wodarek is looking to strengthen the floor performance that earned her a gold medal at WPIALs in her first year of gymnastics last year. “I have been adding more difficulty to my routine and working on perfecting the skills I had before. I am a lot more comfortable with gymnastics this year,” Wodarek said. Wodarek started doing gymnastics last season during her sophomore year, but she has been a cheerleader for years. She competes on Baldwin’s competition and game day cheerleading squads, serving as a competition co-captain. “She really improves the team because she has strong tumbling skills, and she also has a great personality to be around,” Winkowski said.